Note: All the diagrams below were created using Gliffy, a fantastic web-based diagram editor. The latest version has been rebuilt using HTML and JS instead of Flash, and it really is a joy to use. I’m going to copy the approach Joost Diepenmaat used in his excellent article Constructors Considered Mildly Confusing, by providing diagrams to illustrate the actual objects, properties and relationships that result from particular code statements. Incidentally, if you haven’t read Joost’s article, I recommend you do so. If you’re like me, and have frequently muddled through JS prototyping like it’s a JobInterviewQuicksort, then it’s a great introduction to how everything actually works under the hood. This should be easy to follow, even if you’ve never seen TypeScript before. It declares a base-class Animal with a constructor and a move instance method, and two classes, Snake and Horse that inherit from it. 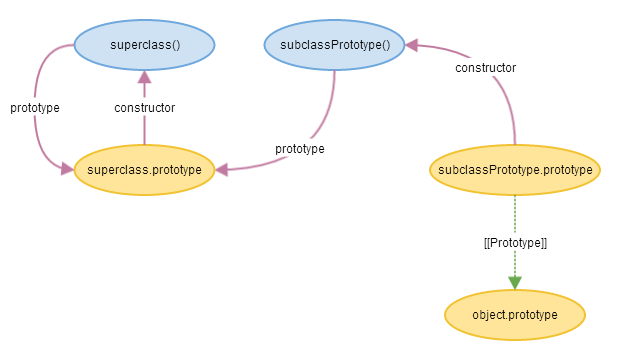 The inheriting classes have their own constructors, which call the superclass constructor. They also provide overriding implementations of the move method that also call the corresponding superclass method. The code has roughly the same shape as the TypeScript code, but there is a bit more going on. 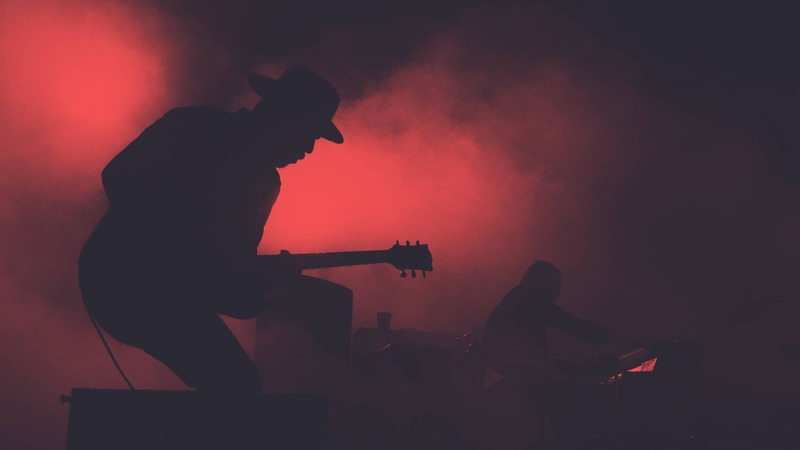 The class definitions have been replaced with immediately-invoked anonymous functions, and a new function __extends has been inserted at the top. This function may only be four lines long, but it is the key to TypeScript’s implementation of class inheritance. Let’s step through the code section by section, as if it were executing, and visualise exactly what’s happening with diagrams. The first thing that happens is that the __extends function is declared and defined, if it has not already been defined elsewhere by some other compiled TypeScript code. We can ignore the actual contents of this function for now, and use a diagram to explore what a function declaration such as this one actually corresponds to behind the scenes. Note: These diagrams can be interpreted as follows: Every ellipse represents an object. Yellow ellipses are regular objects, whereas the blue ellipses with names ending in parentheses are function objects. Arrow connections represent properties of an object, where the connection’s label is the property name, the arrow points from the object to which the property belongs, to the object referenced by the property. 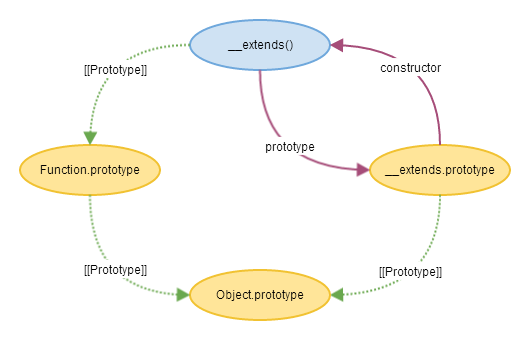 For example, in the diagram below, the __extends function object has a property named prototype that references the __extends.prototype object. Because Animal is a base-class within TypeScript, it doesn’t make use of the __extends function. Instead, we can see that it has been compiled into a pretty standard prototype pattern declaration, which is returned as the result of an immediately-invoked anonymous function and assigned to variable. The only possibly confusing thing is the duplication of the name Animal for both the function inside the anonymous function and the variable in the parent scope. Every use of Animal within the anonymous function references the function declaration, whereas every use outside references the variable that gets assigned to the result of the anonymous function. However, since the former is what gets assigned to the latter, it makes no practical difference. Here we’ve new-ed an instance of Animal assigned to a variable called jim. What would this give us? To avoid overcomplicating the diagram, I’ve removed some of the unimportant [[Prototype]] links and the Function.prototype object, but in reality they would still be there. 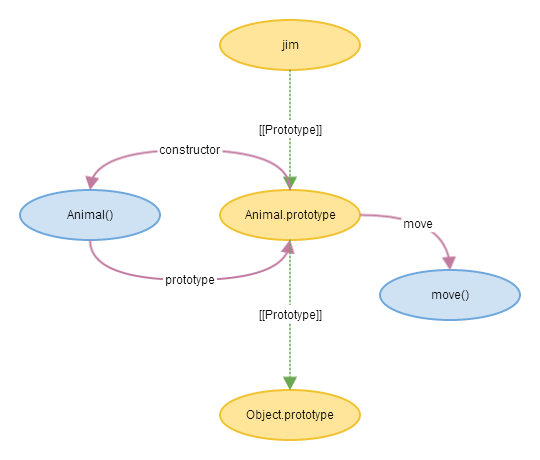 Instead, let’s concentrate on what’s happening with the jim variable: It is an object, whose internal [[Prototype]] property points to Animal.prototype, and therefore it will inherit the properties of that object, namely the move property and its associated function. Calling jim.move() will execute Animal.prototype.move, unless we have overridden it by setting a move property on the jim object itself. Again we have an immediately-invoked anonymous function, but this time it takes a single argument, Animal. This argument is referred to as _super within the anonymous function body. Leaving aside the __extends call for a second, we can see that the body of the anonymous function contains another prototypal declaration, similar to that of the Animal declaration above. If we compare the code with the original TypeScript, we can see that the calls to the superclass, which used the super keyword in TypeScript, have been compiled to use the _super argument. 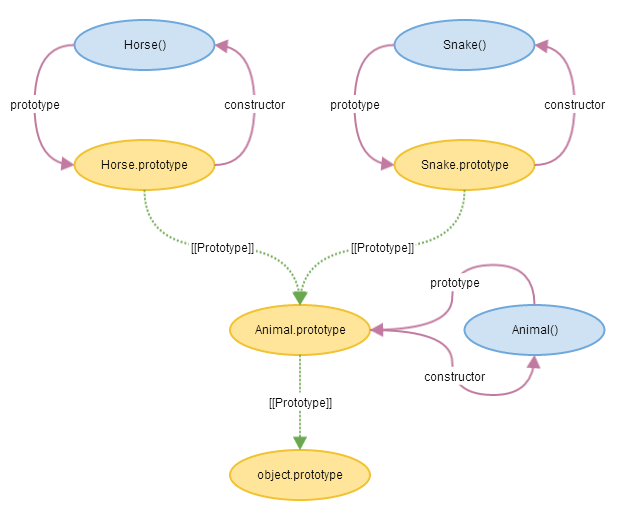 For Snake, _super references the superclass constructor Animal, and _super.prototype property references the Animal.prototype object. The Snake class can access the behaviour of its superclass by call-ing its constructor and its prototype methods and passing in the this reference, which will execute the functions in the context of the subclass instance. Now, what about that __extends call? Although it appears first in the anonymous function body, the Snake function declaration will be hoisted above it by the runtime. Therefore __extends will execute after Snake is declared, but before anything is assigned to Snake.prototype, giving it an opportunity to modify that property first. It is called with two arguments, the Snake function and the _super object. The first thing the function does is to loop through every enumerable property of the superclass and copy it to the subclass. Note that it is the properties of the superclass constructor function that are copied, not those of its prototype. TypeScript likely does this to allow subclasses to access “static” members of their superclass. The next four statements are the trickiest part. As we saw earlier, the runtime will have created a default prototype object for the subclass function, with its [[Prototype]] property referencing object.prototype. 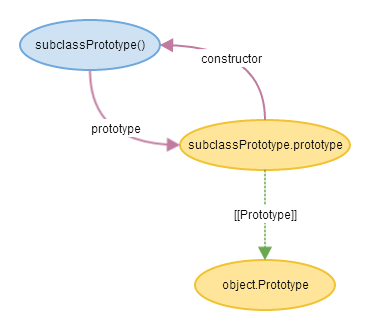 In order to allow instances of the subclass to inherit the superclass properties, the extension mechanism needs to create a replacement prototype object whose [[Prototype]] property points to the superclass prototype. Lets go through the statements one by one. First, there is a function declared, which I have renamed subclassPrototype. 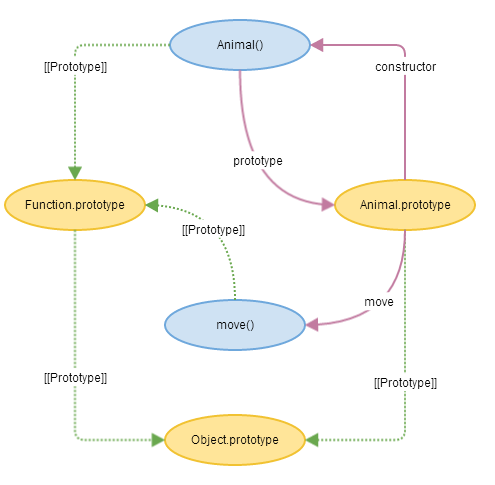 As before, a regular function declaration like this will result in a function object and an automatically created prototype object with a [[Prototype]] chain pointing to object.prototype. Next the prototype property of the subclassPrototype function is assigned to the superclass’s prototype object. The constructor property of the automatically generated prototype object is still pointing to subclassPrototype, but that won’t have any effect, and we can forget about subclassPrototype.prototype from now on. A new object is created. The new object’s internal [[Prototype]] property is assigned to the value of the constructor function’s regular prototype property. The constructor function is executed in the context of the new object. E.g. within the function, the this keyword will be bound to the new object. The new object is returned as the result of the whole new subclassPrototype() expression. We now have a newPrototype object with the correct [[Prototype]] chain, and the correct value for constructor. And this is exactly what we want. 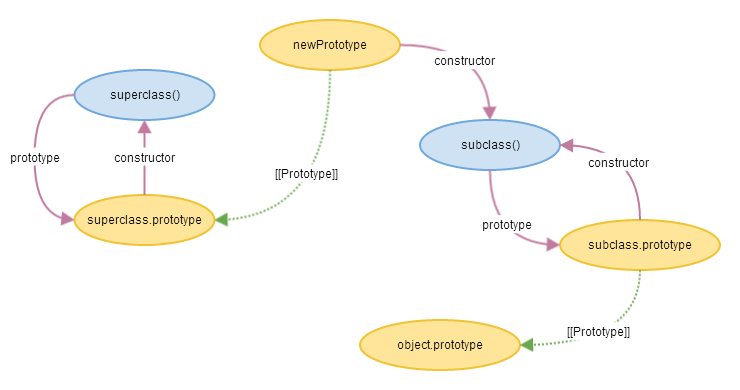 From now on, new-ing an object with the subclass function will result in an object whose internal [[Prototype]] property points to newPrototype, which in turn allows it to inherit from the superclass prototype and also gives its a constructor property that points back to the subclass function. At this point, the __extends function finishes executing, and control passes back to Snake‘s anonymous function. The code can then proceed to add properties to Snake.prototype, which will now reference the correctly configured prototype object that __extends created. The Snake class declaration is followed by the Horse class declaration, which works identically. 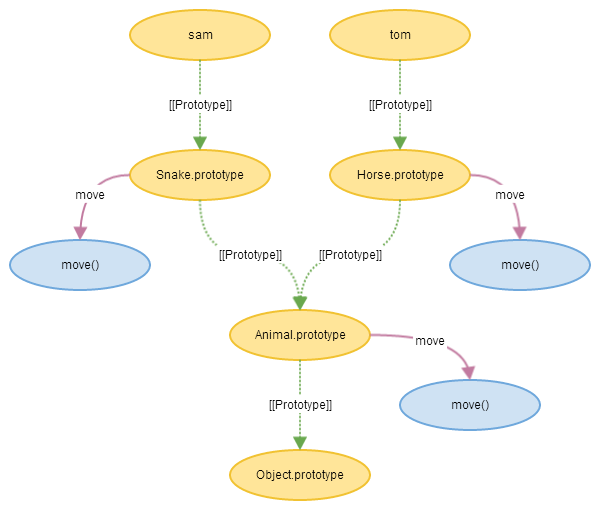 When all three classes have been declared, the result will be a prototype hierarchy where Horse.prototype and Snake.prototype both inherit from Animal.prototype, which in turn inherits from Object.prototype, as illustrated. From then on, things are straightforward. Instances of Horse and Snake are new-ed up and assigned to variables in the usual way, then their instance methods are called. As with any technical article like this, there are likely errors and things I’ve misunderstood. Please let me know of any problems via the comments.